Editor's note: Metromile's online dashboard is now active on the site. This is the driving data analysis "lab" that hadn't launched at the time of our review, and it should provide useful tools for analyzing how you drive. Drive less, pay less for car insurance. Nice idea. MetroMile promises to deliver that by tracking your driving activity through its Metronome device, which plugs into the OBD-II data port in your car. Rates start at $20 monthly and 2 to 5 cents a mile. It could be a real money-saver, assuming you don't drive too much. The startup already offers the service in Illinois, Oregon, and Washington. Poor schmucks in California like me don’t get the insurance offer yet, but we can beta-test the device and app for free, which is what I did in a 2003 BMW 3-series. (Your car must be vintage 1996 or younger to have the OBD-II port needed for all of this to happen.) Currently the app is only available for iOS, but MetroMile says an Android version is coming soon, and even a Windows Phone version after that. 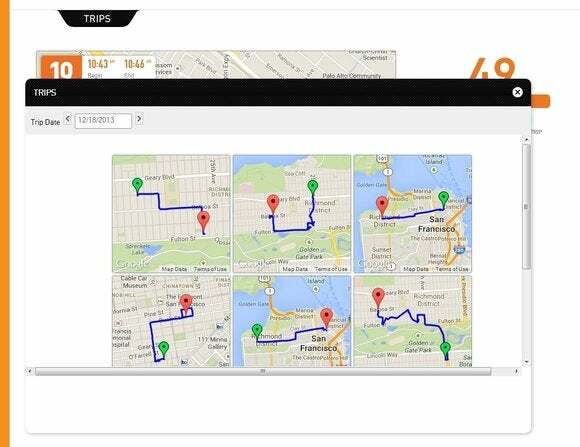 MetroMile offers plenty of trip data, but the maps took a few hours to appear. Installing the Metronome—MetroMile’s name for its OBD-II cellular interface—is easy. It took a bit more force than usual to seat it in the 2003 BMW test vehicle, but there was no tendency to fall out, as with some pressure-fit interfaces we’ve tested. The interface also features a USB port, but that’s for internal use (namely, upgrading the device’s firmware). The app offers engine data, but you can’t do much with it yet. During an extended spin around San Francisco, MetroMile was a country mile from providing the analysis and information tools promised on its website. The iOS app provided some engine information, but the Web portal’s “lab” isn’t available yet, so there’s no habit analysis, as offered by a similar product, Zubie. Currently, you get gas costs and mapped information about trips, but that’s about it. Also, the information MetroMile provided was somewhat inconsistent. The trip maps took a few hours to appear, so you can’t currently use the service to locate a car you’ve misplaced more recently. Don’t laugh—parking in the city can be confusing, and the site promises this ability. MetroMile said the lag was due to overwhelming demand and the beta status of the service. 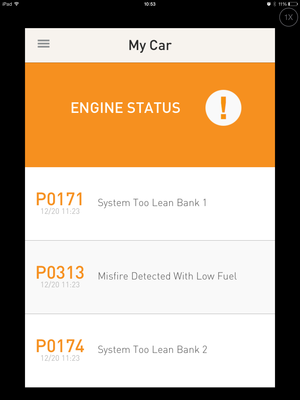 The app was also a couple of days late reporting an engine-light issue. MetroMile could be as precise as showing a turnaround on a driveway and street. On the other hand, it overlooked a trip or two, and occasionally its route drawings showed fascinating, impossible shortcuts through buildings. 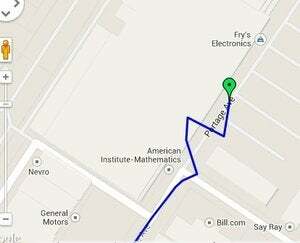 Now that’s what I call a detour: Metromile’s route data occasionally skipped a turn or two. Thanks to the advent of inexpensive Bluetooth, USB, and even cellular OBD-II translator modules, the information generated by your car’s computer and sensors is now available to everyone, not just garages with expensive code readers. Weekend racers, modders, and services such as MetroMile are taking advantage. MetroMile is an interesting concept, and if you’re a low-mileage driver seeking savings on auto insurance, this could be just the thing for you. The company hopes to expand its insurance territory considerably this year. For those that are more interested in real-time tracking as well as driving habits and vehicle health, check out the aforementioned Zubie. There are also any number of Bluetooth and USB OBD-II translators and apps available for data and analysis. This story, "Driving with data: MetroMile app is nice, but the pay-per-mile insurance is the real draw" was originally published by TechHive.